Tennis legends Pete Sampras and Todd Martin crashed Super Bowl week at "Match For A Cure," at Bankers Life Fieldhouse on Sunday, Jan 29 at 7:00 p.m.
BP Sports and Entertainment presented the all-star evening of tennis to entertain area fans while helping cancer charities fulfill their mission to raise awareness about the need to find a cure and provide support for those battling cancer. The USTA/Midwest Section hosted an information booth, led a 10 and Under Tennis on-court exhibition, and sponsored give-aways at the door. Kid's Club mascot Ace was on hand for photo opportunities. 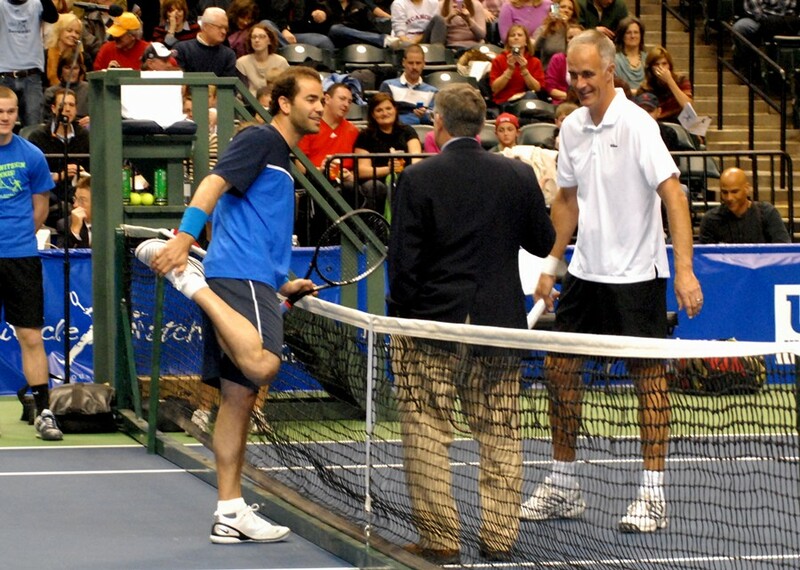 The event also featured the Ultimate Miracle Match—Pete Sampras versus Miracle Match Foundation founder, leukemia survivor and tennis professional Bill Przybysz. The pre-match gala was held at the Locker Room Restaurant (inside Bankers Life Fieldhouse) from 5:00 – 6:30. VIP ticket holders and sponsors attended the event that featured a question-and-answer session with the players, and opportunities for autographs and pictures with the stars.